We were contacted by Natalie’s mom asking for one of our “Kids and their Dolls” hats. You see, Natalie was diagnosed with Acute Lymphoblastic Leukemia (ALL) on October 16, 2015. She has a three year old brother who is an amazing little guy. Natalie’s favorite colors are, like most little girls, pink, purple and teal. Her favorite animals are dolphins and horses. Her favorite princess is Merida from Brave and she loves TY stuffed animals. She loves doing fun craft projects at home and she even has a facebook page. Her mom says, “We know God is good and will continue to carry us through this”. We are so inspired by this courageous young lady and we were honored to send her and her doll hats from our new program “Kids and Dolls “! 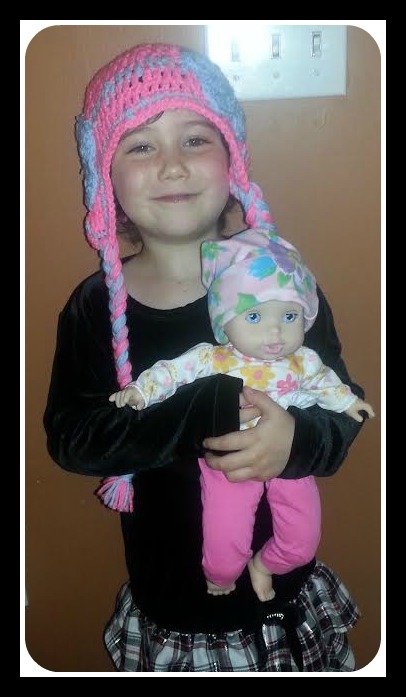 We are so thankful her mom shared the picture above of Natalie beaming with her doll! You can follow Natalie on her Journey on Facebook at Kicking Cancer with Natalie. Thanks to your mom for making the adorable hats.